Job Search and Career Planning for YOU! Just starting out, trying to decide on your career? Looking for a career change? No matter where you are in the job search process we can help you learn the tools and skills to choose your career, search for jobs, write a stand out resume and develop impressive interview skills. Deciding on a career can be daunting. The key is to pair your passion and personality traits with your strengths. Then look at the outlook for specific careers over the next decade to see what particular fields and careers fit your chosen path best. Start your exploration here! Discover your interests, personality type and skills to see which career path you might follow. Browse through our other Career Planning resources links. Make an appointment to talk to us to be sure you are on the right track. Full-time, part-time and internship opportunities are available from area employers. 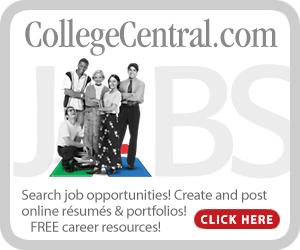 Register for College Central Network to search our online Job Board and browse career oriented podcasts, videos and news articles. Search job listings and set up your job agent. Build, update and forward your resume and/or career portfolio to employers. Download free career advice documents and podcasts. Learn expert job search tips from over 100 free career videos. For more job search sites and other job search resources visit our Resources page or make an appointment to work with us to build your job searching skills. Appointments are available year round for career planning, resume and cover letter writing, interview skills, job search skills and other career related topics. Appointments are required, so please be sure to call or email in advance to make an appointment. If you are coming in for help with your resume be sure to bring a copy of your current resume with you. If you do not have a current resume be sure to ask for our resume templates when making your appointment. During the fall and spring semesters we offer several workshops on resume and cover letter writing, interview skills and more. Need help writing or polishing your resume? Do you know how to tailor your resume for online job postings? Do you know how to write and effective cover letter? Attend one of our workshops or stop by and make an appointment with one of our staff to ensure that you stand out in the crowd. Will you be going on your first interview or has it been a while since you have interviewed? Attend one of our workshops or make an appointment to find out how to present yourself, the most common questions asked, recommended ways to answer questions, what you should ask a company and how to follow up after an interview. This event, offered once in the fall and once in the spring, offers you the opportunity to practice your interview skills with real employers. Learn to interview with confidence!! Be ready to for job interviews, job and career fairs, college transfer interviews and internships. Pre-registration is required. Need blind admission is a college admission policy in which the admitting institution does not consider an applicant's financial situation when deciding admission. There are many factors looked at when they consider students for admission but their ability to pay is not one of them. Some colleges and universities that offer need blind admission also will help cover a large amount, if not all, of the tuition with various financial aid programs and scholarships. But not all need blind admission schools have funding available to cover full tuition. You will need to carefully review what the current policies are for each college you are interested in. Admission policies also vary on whether or not students transferring from another college quality for need blind admission. Some schools will only offer that to incoming freshman while others offer it for everyone. Even more limited may be need blind admission for international students. Is the college or university still a need blind admission school? Do they include students who are transferring from another college? What and how much financial aid they will offer? If you are interested in finding out more about need blind admission contact the Center for Job Placement and College Opportunities office for an appointment. Need Blind College and University listing.